From the time the first strange fossils were found in the early 1800s to the discovery of Sue and Supersaurus, dinosaurs, and other species of the Triassic, Jurassic and Cretaceous, have fascinated us. Their extinction, whether by Biblical deluge or stray comet, makes them all the more mysterious. We have day-dreamed about them while reading fiction like Crichton's Jurassic Park or Conan Doyle's The Lost World, and fantasized over their remains in museums. Paleontologists, evolutionary biologists and fossils hunters have been writing reports, essays and books, both popular and scientific, about these creatures for almost as long as their bones have been available for study. The 1950s and 60s saw a profusion of titles that described and explored the lives of these creatures, using the latest scientific discoveries to bring them to life ... and the public imagination was fired! The entries in this section are links to books on the Natural History and the Sciences list. but rightly belong in the Paleontology or Geology sections. [British Museum (Natural History)]. A Guide to the Fossil Reptiles and Fishes in the Department of Geology and Palæontology. British Museum (Natural History): London, 1896. [Seventh edition ...]. [Tea Card set] . Prehistoric Animals. Croydon [England]: Brooke Bond Oxo Ltd., . Text by Dr. Alan Charig, illustrations by Maurice Wilson. Complete set of 50 small (1.5" x 2.75") cards, originally issued in packages of Brooke Bond Tea. Full colour image of extinct creatures from the Upper Devonian (Eusthenopteron) to the Middle Pleistocene (Australopithecus), most from the age of dinosaurs; verso provides accompanying explanatory text. A fine, clean, bright set in protective sheets. Clark, Austin H. The New Evolution: Zoogenesis. Baltimore: Williams & Wilkins, 1930. Orange pictorial (stegosaur in silhouette) dust jacket. Colbert. Edwin H. The Age of Reptiles. New York: W.W. Norton, 1965. First edition. From The World Naturalist series. A classic work on the Mesozoic age, written from a reptilian perspective, by one of the leading paleontologists of the day; "illustrated by 16 pages of half-tones and 67 line drawings". A near fine copy in original green cloth a bit bumped at top corners and with a few faint marks on covers; gold and black pictorial (reptilian dinosaur) dust jacket creased at top edge and spine ends; closed tear at lower rear flap fold; price-clipped but with publisher's new price. Colbert. Edwin H. The Age of Reptiles. New York: W.W. Norton, 1965. Second printing. From The World Naturalist series. "Illustrated by 16 pages of half-tones and 67 line drawings". Original green cloth a little faded on rear panel, spine gilt bright. gold and black pictorial (reptilian dinosaur) dust jacket lacking small pieces at head and tail of spine; with small scrape on front panel near title. A very good copy. Colbert, Edwin H. Digging into the Past. New York: Dembner Books, 1989. [First edition]. "An Autobiography ..." Illustrated with drawings and photographs. Original grey boards with blue cloth spine, bright and clean; pictorial (Colbert in the fields) dust jacket, with minor creasing at bottom of front panel, and faint rubbing at spine ends. A fine copy. Desmond, Adrian J. The Hot-Blooded Dinosaurs: A Revolution in Palaeontology. New York: Dial Press/James Wade, 1976. Second American printing. Profusely illustrated with photographs, historical engravings, and modern art work; printed in brown. A near fine copy in original brown rexine, with "ding" at bottom edge of front cover; pictorial (Jurassic view) full colour dust jacket, price-clipped and a touch sunned on spine. Encyclopedia of Dinosaurs. New York: Beekman House, 1990. Extensively illustrated in full colour and b/w. A fine copy in original oblong folio pictorial (Corythosaurus herd) laminated boards; p.15/16 creased. Near fine matching dust jacket a touch rubbed and lightly edge creased. A review of dinosaur paleontology, followed by a species-by species compendium; "A Visual Guide to Prehistoric Life with Over 140 Dinosaur Profiles." Glut, Donald F. The Dinosaur Dictionary. New York: Bonanza Books, 1972. Later printing. Profusely b/w illustrated alphabetical compendium of dinosaurian species; excellent basic reference. Original light orange boards with beige cloth spine; colour pictorial (Yale mural) dust jacket, with very light creasing to head of spine and top rear corner. Fine. Grady, Wayne. The Dinosaur Project: The Story of the Greatest Dinosaur Expedition Ever Mounted. Edmonton: Ex Terra Foundation; Toronto: Macfarlane Walter & Ross, 1993. [First edition]. Black ink mark on bottom edge, as new in pictorial (mounted Monolophosaurus) dust jacket. The story of the Canada-China Dinosaur Project, "the most extensive, comprehensive field expedition in the history of paleontology ..."
Horner, John R. and Gorman, James. Digging Dinosaurs. New York: Workman Publishing, 1988. First printing. "The search that unraveled the mystery of baby dinosaurs." Illustrated with art by Donna Braginetz and Kris Ellingsen, and with 8 pages of colour photographs. Original black boards with cloth spine, bright and clean; price-clipped red pictorial (Horner) dust jacket. A fine copy. Horner, John R. and Dobb, Edwin. 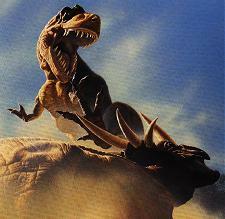 Dinosaur Lives: Unearthing an Evolutionary Saga. New York: HarperCollins, 1997. First edition. Illustrated throughout with photographs and drawings. Cream boards with brown cloth spine; cream pictorial (Horner) dust jacket; a fine copy. Lessem, Don. Kings of Creation: How a New Breed of Scientists is Revolutionizing Our Understanding of Dinosaurs. New York: Simon & Schuster, 1992. First edition. Illustrated with photographs, artwork, models and maps. Original green boards with grey cloth spine; small black mark to bottom edge. Pictorial (Deinonychus and Iguanadon) dust jacket, with a hint of sunning to spine. Fine. Man, John. The Day of the Dinosaur. London: Bison Books, 1978. Profusely illustrated with b/w photos and historic engravings, as well as full-colour art work. Original pale green boards bumped at front spine corners. Price-clipped colour pictorial (Peabody Museum mural) dust jacket excellent. A fine copy. McLoughlin, John C. Archosauria: A New Look at the Old Dinosaur. New York: Viking, 1979. [First edition]. "...A look at some of the modern interpretations of the life of the Mesozioc Era", profusely illustrated with b/w pen and ink drawings by the author. A near fine copy in original black boards, small (1/4") faint tan patches on endpapers; b/w pictorial (dinosuar world) dust jacket cut shorter than volume (as usual). Muller, Richard. Nemesis. Weidenfeld & Nicholson: New York, 1988. First edition. Preiss, Byron and Silverberg, Robert (eds.). The Ultimate Dinosaur: Past, Present, Future. New York: Bantam, 1992. [First edition]. "From the World's Leading Scientists and Visionaries ... Philip Curie, Ray Bradbury, Peter Dodson, Harry Harrison ... and many more." This unique look at dinosaurs combines in each chapter ("The First Dinosaurs", "The Changing World", "Dinosaur Behavior", etc.) scientific essays, original art and short stories, reflecting the latest research on the subject. A fine copy in near fine, price-clipped, lightly corner bumped pictorial dust jacket. Psihoyos, Louie with Knoebber, John. Hunting Dinosaurs. London: Cassell, 1994. First edition. A photo-journalist's view of current field and laboratory work in dinosaur studies, as much about the international paleontologists as about their expeditions and discoveries; wonderfully illustrated with colour photographs. A fine copy in black boards and cloth spine; fine pictorial (paleontologist and Carnotaurus model) dust jacket. Russell, Dale A. An Odyssey in Time: The Dinosaurs of North America. [Toronto]: University of Toronto Press; National Museum of Natural Sciences, 1989. [First edition]. Illustrated in colour with photographs, maps, and art work, many of the latter full or two-page works. A fine copy in original black boards; black pictorial dust jacket, with a few tiny "dings" at lower spine corner of rear. "Russell has created an entirely new kind of dinosaur book and done it so skillfully that its appeal will extend to a very broad audience ..." (cf. dust jacket). Swinton, W.E. Dinosuars. British Museum (Natural History): London, 1967. Third edition. Author's own copy. Wallace, Joseph. The American Museum of Natural History's Book of Dinosaurs and Other Ancient Creatures. New York: Simon & Schuster, 1994. First edition. A fine copy in original gilt-lettered reddish-brown boards; decorative (fossil ground with pictorial insets) dust jacket clean and bright. Well illustrated with photographs of fossil skeletons, digs and the staff at work, and with artwork commissioned by the museum. This book celebrated and anticipated the 1996 re-opening of the Fossil Halls; it delves into the history of the Museum, American fossil hunting and paleontologists, and a gallery by gallery review of the new exhibits. Wallace, Joseph. The Rise and Fall of the Dinosaur. New York: Gallery Books, 1987. Exetensively illustrated: half of almost every page is a painting or model of a dinosaur in life-like situation, or a diagram or photograph. Original black cloth with minor "dings" to bottom edge; pictorial (allosaurus model) dust jacket with 1" closed tear at bottom front hinge and a hint of wear at spine ends. Near fine. Wilford, John Noble. The Riddle of the Dinosaur. New York: Knopf, 1985. First edition. "With 34 black and white illustrations and with 7 full-color lithographs by Douglas Henderson." A fine copy in original gilt-lettered grey boards with cream cloth spine; pictorial dust jacket a touch curled at top edge. An excellent survey of dinosaur scholarship. Edmonds, William. The Iguanodon Mystery. Harmondsworth: Kestrel Books, England, 1979. First edition. Signed by the author on title page and with presentation inscription on half title. Gilt-lettered brown boards lightly bumped at corners and spine ends; pictorial (iguanodon pond near Chrystal Palace) dust jacket barely creased at edges. A fine copy. This book traces (through photographs, drawings, diagrams and text) the advances in the study of dinosaurs by examining one creature, the Iguanadon. Polisar, Barry Louis. Dinosaurs I Have Known. Silver Spring, Md: Rainbow Morning Music, 1986. First edition. Illustrated with b/w artwork by Michael Stewart. Full colour pictorial (Saxosaurus) boards and matching dust jacket, both bumped at corners and lightly creased at spine ends; jacket with a few short closed tears at bottom edge of rear panel. A wonderfully fanciful compendium of "everyday" dinosaurs, ranging from Voluptuous Rex (Marilyn Monroe with tail and scaley skin) to Triswamitops (Triceratops as eastern mystic), truly "A Dinosaur Book for Kids and Adults".